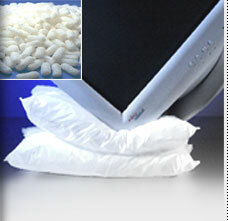 Bio plastics are biodegradable plastics, whose components are derived from renewable raw materials. These plastics can be made from abundant agricultural/animal resources like cellulose, starch, collagen, casein, soy protein polyesters and triglycerides. Large scale use of these would help in preserving non-renewable resources like petroleum, natural gas and coal and contribute little to the problems of waste management. Biodegradable Plastics degrade over a period of time when exposed to sun and air. 1) Customer response to costs. Immediate application areas identified in India for biodegradable plastics are Agricultural Mulch, Surgical implants, Industrial Packaging, Wrapping, Milk Sachets, Foodservice, Personal care, Pharmaceuticals, Medical devices, recreational etc. Biodegradable Plastics highlights the Indian efforts in the direction, as well as activities at some of the major centers of developmental at USA/Canada, Germany, Scandinavian countries and Japan. In an effort to overcome these shortcomings, biochemical researchers and engineers have long been seeking to develop biodegradable plastics that are made from renewable resources, such as plants. The term biodegradable means that a substance is able to be broken down into simpler substances by the activities of living organisms, and therefore is unlikely to persist in the environment. There are many different standards used to measure biodegradability, with each country having its own. The requirements range from 90 per cent to 60 per cent decomposition of the product within 60 to 180 days of being placed in a standard composting environment. The reason traditional plastics are not biodegradable is because their long polymer molecules are too large and too tightly bonded together to be broken apart and assimilated by decomposer organisms. However, plastics based on natural plant polymers derived from wheat or corn starch have molecules that are readily attacked and broken down by microbes. Biodegradable plastics made with plant-based materials have been available for many years. Because of their higher cost they have never replaced traditional non-degradable plastics in the mass market. Indeed, biodegradable plastic products currently on the market are from 2 to 10 times more expensive than traditional plastics. But environmentalists argue that the cheaper price of traditional plastics does not reflect their true cost when their full impact is considered. For example, when we buy a plastic bag we don't pay for its collection and waste disposal after we use it. If we add up these associated costs, traditional plastics would cost more and biodegradable plastics might be more competitive. If cost is a major barrier to the uptake of biodegradable plastics, then the solution lies in investigating low-cost options to produce them.The Cooperative Research Centre (CRC) for Food Manufacture and Packaging Science is looking at ways of using basic starch, which is economical to produce, in a variety of blends with other more expensive biodegradable polymers to produce a variety of flexible and rigid plastics. These are being made into 'film' and 'injection moulded' products such as plastic wrapping, shopping bags, bread bags, mulch films and plant pots. The CRC has developed a mulch film for farmers. Mulch films are laid over the ground around crops, to control weed growth and retain moisture. Normally, farmers use polyethylene black plastic that is pulled up after harvest and trucked away to a landfill (taking with it topsoil humus that sticks to it). However, field trials using the biodegradable mulch film on tomato and capsicum crops have shown that it performs just as well as polyethylene film but can simply be ploughed into the ground after harvest. It's easier, cheaper and it enriches the soil with carbon. Another biodegradable plastic product is a plant pot produced by injection moulding. Gardeners and farmers can place potted plants directly into the ground, and forget them. The pots will break down to carbon dioxide and water, eliminating double handling and recycling of conventional plastic containers. Depending on the application, scientists can alter polymer mixes to enhance the properties of the final product. For example, an almost pure starch product will dissolve upon contact with water and then biodegrade rapidly. By blending quantities of other biodegradable plastics into the starch, scientists can make a waterproof product that degrades within 4 weeks after it has been buried in the soil or composted. Compost may be the key to maximizing the real environmental benefit of biodegradable plastics. One of the big impediments to composting our organic waste is that it is so mixed up with non-degradable plastic packaging that it is uneconomic to separate them. Consequently, the entire mixed waste-stream ends up in landfill. By ensuring that biodegradable plastics are used to package all our organic produce, it may well be possible in the near future to set up large-scale composting lines in which packaging and the material it contains can be composted as one. The resulting compost could be channeled into plant production, which in turn might be redirected into growing the starch to produce more biodegradable plastics. For anyone who thinks such schemes aren't feasible, you only have to look at the recycling success of the Olympics to see that where there's a will, there's a way. More than 660 tonnes of waste was generated each day at its many venues. Of this, an impressive 76 per cent was collected and recycled. Part of this success was due to the use of biodegradable plastics used in the packaging of fast food, making the composting of food scraps an economic proposition as it eliminated the need for expensive separation of packaging waste prior to processing. With intelligent use, these new plastics have the potential to reduce plastic litter, decrease the quantities of plastic waste going into landfills and increase the recycling of other organic components that would normally end up in landfills.